Throwing around words like ‘hidden gem’ is something we try to avoid, but in the case of Bondi Junction’s Zebra Green, it’s completely appropriate. 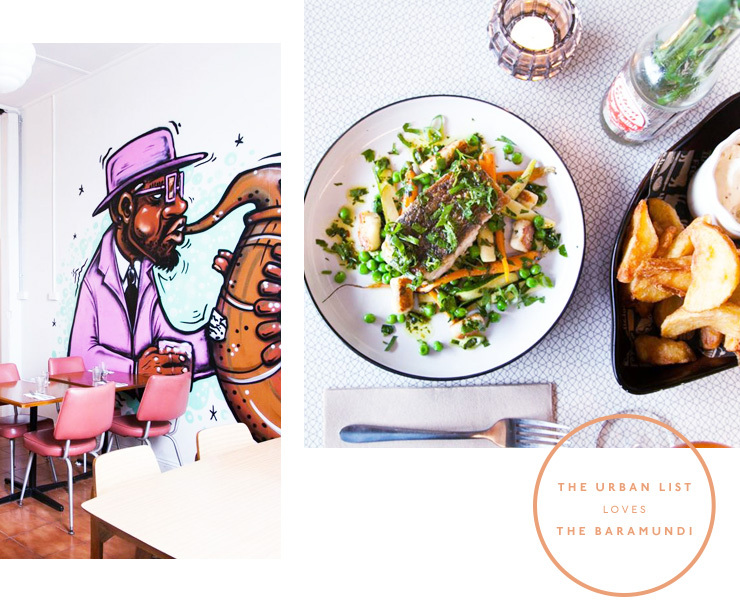 Hiding in plain sight on Bronte Road, this restaurant is home to delicious food, and kind people that don’t bat an eyelid when you tell them that you’re lactose intolerant, vegan, gluten free, or just hate cheese (you crazy human). From the street, Zebra Green looks like an unassuming takeaway shop and you’ve probably walked past it upwards of three million times. The real magic happens once you enter the courtyard out back, so our hot tip is to request a table out there. 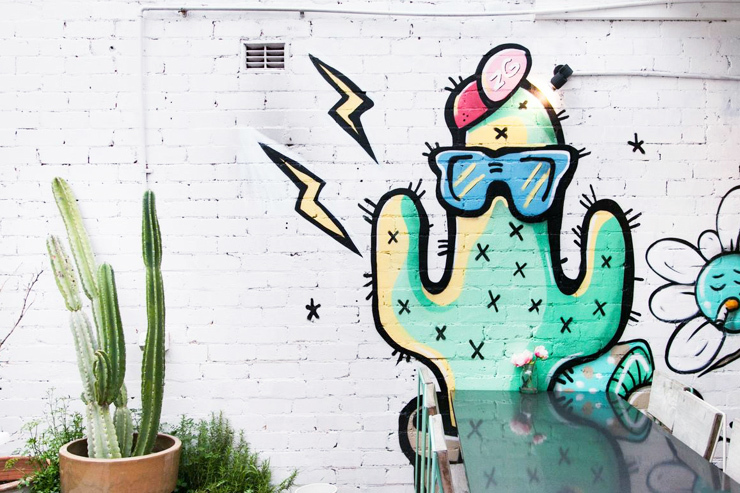 It has some pretty strong Melbourne vibes—from the rainbow of street art lining the walls, to mismatched tables and chairs that all totally work together and the super kind waiters we mentioned earlier. Once we took our seat and engaged in some pretty great banter with our waiter, we turned our attention to the food. We kicked off the night with the local cheese board because it’s the logical (and most delicious) place to start any meal, amirite? Next I went a little bit mental and ordered a couple of main dishes, all in the name of research obviously, so I’ll break it down for you. You’d be forgiven for thinking that the hand cut chips are a waste of valuable stomach space, but here, you’d also be wrong. We can’t reveal what’s actually on the triple-cooked wedge-style chips—because they wouldn’t tell us—but our guess is a magical mix of smoky paprika. Next was the humpty doo barramundi, which is more than just a ridiculously cute name, served with roasted young carrots, ricotta gnocchi, peas and parmesan. The barramundi was, to quote Matt Preston, cooked to absolute perfection. You know fish is cooked perfectly when you don’t ever have to get your knife dirty and mine stayed perfectly clean throughout the entire meal. At this point, curiosity got the better of me, so I ordered the vegan rigatoni Bolognese, which was promised to be as good as it’s traditional meat counterpart. We were sceptical—so naturally, we ordered it—but were pleasantly blown the hell away, because this dish is so close to the real thing thing that even my dad wouldn’t notice there’s no meat in there. Head Chef and owner, Shane, told me that he’s pretty damn proud of this one—as he should be—and tinkered with the ratios of mushroom and eggplant to smoke for some time, until he had it just right. It should also be noted that he told me this as he wandered around to say hello to every single person at every single table, because he’s just that type of guy. A kind type of guy, that is. Once dessert rolls around, your delightful waiter will present you with a tray of desserts, so you don’t have to risk dessert envy (the worst of all food envies) by choosing blindly off the menu. There are chocolate lava cakes, cheesecakes and sticky date pudding to name a few, and we love that you can check out the goods before choosing. Zebra Green make all of their own sauces in house and you can pick one up to take home with you. Which you should because our favourite is the Smoky Apple Sweet Chilli, which is their collab with Young Henrys and let me tell you—it’s the goods. We also checked out Osaka Trading Co. and you can read all about it here.